Watching Durham Bulls Baseball: Arencibia/Casali Rule! Bulls fans could not have hoped for a better home stand than what we just went through. Nine games in eleven days; seven wins; good crowds, over 65,000 fans; decent, but not great, weather. Not only that, the Bulls end the stand back in a three-way tie with Charlotte and Norfolk for first place in the International League South Division. They are off to Lawrenceville, Georgia to play the Braves for three games, then back to the DBAP. This is the first real break for the DBAP’s turf in a very, very long time. The fun part of last night’s game was watching J.P. Arencibia and Curt Casali shine. Neither of them is having a particularly good year at bat, but times could be changing. Arencibia played first base and batted 4th. Casali was the DH and batted fifth. Between them they accounted for 6 of the Bulls' 9 hits, 2 of the RBI, and all of the runs scored. Arencibia started in off in the 2nd inning with a single and Casali hit a home run to bring him in (Casali’s second home run in a row since he’d homered Wednesday night in his last at bat). With one out in the 4th inning Arencibia singled again, Casali singled him to third base, and Richie Shaffer drove him in with a double. Arencibia led off the 6th with a double, went to third base (again) on a Casali single, and came home on a Corey Brown sacrifice fly. Scott Diamond kept things quiet until the 5th and Sandberg was quick with the hook. Probably because the relief crew needed the work and they have been exceptional during this home stand. In the last four games they have not allowed a single earned run over those 15+ innings. Bulls reliever Kirby Yates made his first rehab appearance with the Charlotte Stone Crabs. One not-very-successful inning. Box. Juniel Querecuto has moved to Montgomery. He was 1 for 4 playing shortstop in a Biscuits loss to the Jacksonville Suns. Box. Wrap. I mentioned the relievers' recent performance above. Here’s a chart that shows how they’ve been doing this year. As with most of the charts so far it’s early days in the season and the sample size is small. 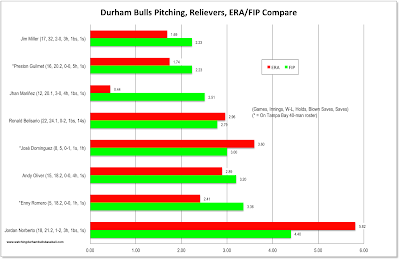 This shows the ERA and the Fielding Independent Percentage (FIP) for the relief crew. FIP is one of those newish sabermetric stats that tries to focus on just those things the pitcher controls. As the season goes along FIP and ERA will probably get closer in synch. This chart is sorted by FIP. A few more caveats: Obviously, José Dominguez’s sample is too small for any kind of conclusion, just 5 innings so far this year. Ronald Belisario’s 14 saves are the best in the International League and he’s coming up on his opt-out date. All who are on the 40-man have seen time with Tampa Bay this year. A couple of players currently with the Rays have seen significant time with the Bulls this year, but aren't on this chart. Jim Miller and Jhan Mariñez have been really impressive and important to the Bulls this year. Even with all the caveats, for these are mostly very good numbers. 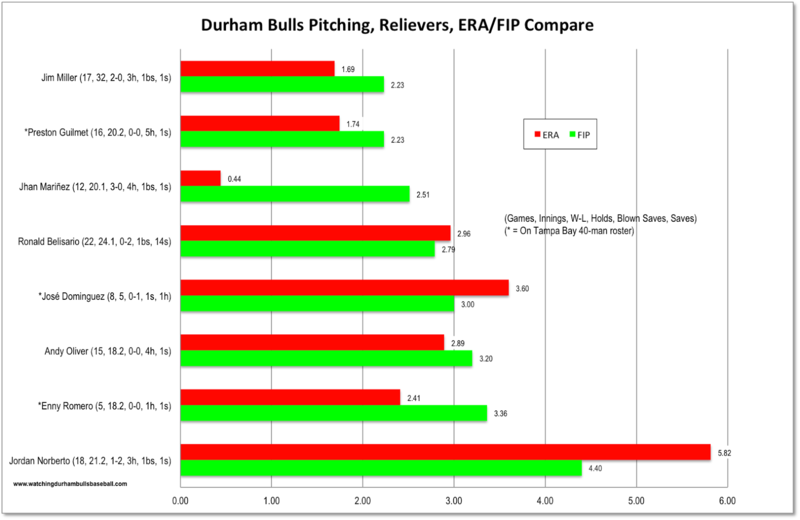 The overall ERA for Bulls relievers on the year is 3.10.